I can’t begin to imagine how it felt to be Jason Segel, Nick Stoller, and James Bobin—the screenwriters and director, respectively, of The Muppets, in theaters today—on the day news broke that their film had drawn the ire of original Muppet performer Frank Oz. Reading that their attempt at reviving characters who meant so much to them for so long didn’t have the approval of one of the people who made them love those characters in the first place must have been heartbreaking. However, if I were in any of their shoes, I certainly would’ve read Oz’s thoughts on the movie—“I wasn’t happy with the script. I don’t think it respected the characters. But I don’t want to go on about it like a sourpuss and hurt the movie”—in the voice of Sam The Eagle, the Muppets’ resident censor and tut-tutting sourpuss. A dose of goofy humor would be the only way to deal with the non-blessing of a Muppet vet like Oz (effectively the next-worst thing to the ghost of Jim Henson appearing at the film’s première and cursing everyone in attendance). Goofy humor is a coping mechanism Segel, Stoller, and Bobin frequently use in their work. Think of Segel’s character channeling his romantic frustrations through the puppet musical A Taste For Love in the Segel-and-Stoller-scripted Forgetting Sarah Marshall, or the many, many times Bobin shot the everyday slights encountered by Jemaine Clement and Bret McKenzie through the lens of big-budget music videos on Flight Of The Conchords. Like countless other Muppets fans, they saw that coping mechanism in the work of Henson and Oz. Like the guys behind the new Muppet movie, I’ve always had Henson and The Muppets in my life. I was young enough to be in the target audience for the Muppet Babies cartoon during its original run; somewhere in my parents’ basement, there are VHS cassettes full of that show, along with tapes of the short-lived Jim Henson Hour and reruns of The Muppet Show. I saw all three of the Muppet films made after Henson’s 1990 death—The Muppet Christmas Carol, Muppet Treasure Island, and the unfairly maligned Muppets From Space—during their respective theatrical runs. On one gray winter afternoon in college, I splurged on a copy of Jim Henson: The Works, a handsome coffee-table book that’s also the closest thing to a proper, in-depth, fully authorized biography of the Muppet creator. Three Christmases ago, I even became a Muppet, with the help of my then-fiancée (and now-wife) and FAO Schwarz. Yet for all that, I’ve always felt iffy about the Muppets at feature-length. Their hijinks are tremendously entertaining in half-hour chunks, but they can take a turn toward grating over the course of 90 minutes. Part of the appeal of The Muppet Show is the way its episodes barrel forward and rarely let up; that’s a difficult aesthetic to maintain for an entire movie. And within the last 20 years, that’s had an adverse effect on the Muppets’ cinematic output. I’ll defend Muppets From Space, but I’ll also admit that certain elements of the film haven’t aged well. (How about that extended Dawson’s Creek riff, huh?) And while The Muppets is the first new theatrical release starring the classic Muppet characters in more than 12 years, it’s not like they sat on the shelves and in the filing cabinets of the Creature Shop all that time. The ’00s saw a steady stream of made-for-TV movies starring Kermit and the gang, though they range from forgettable (A Muppets Christmas: Letters To Santa) to unnecessary (The Muppets Wizard Of Oz) to downright awful (It’s A Very Merry Muppet Christmas Movie, which reaches Family Guy proportions of questionably deployed pop-culture riffs). In that time, I was reluctant to revisit the original trio of theatrical Muppet releases: The Muppet Movie, The Great Muppet Caper, and Muppets Take Manhattan. I recalled the bright spots of these films being brighter and more frequent than those of the ’90s Muppet movies, but I had a nagging feeling that the failings of those ’90s efforts and later TV movies were holdovers from the old days. What if, when revisited, the culturally aware components of The Great Muppet Caper looked as shallow and unfunny as those in It’s A Very Merry Muppet Christmas Movie—a film that contains a segment where Fozzie Bear is painted green, mistaken for The Grinch, and chased by an angry mob of look-alikes from Ron Howard’s How The Grinch Stole Christmas adaptation? The Great Muppet Caper also features a version of Fozzie who’s painted green—but it’s an element of one of the film’s sharper gags. The puppet is a Kermit-Fozzie hybrid that serves to justify the joke that Kermit and Fozzie play identical twins in the film—yes, they’re playing roles here, which we’ll get into later—the type of brilliantly bizarre, subtly played jokes that recur throughout the first three Muppet movies. As I discovered while re-watching The Muppet Movie, The Great Muppet Caper, and The Muppets Take Manhattan, my perception-warping fears about the films proved unfounded. In fact, I should’ve revisited them sooner, as they act as something of a key to other comedic styles and performers I’ve come to appreciate as I grew up. As an adult viewer, much of the fun in re-watching these films is in seeing how they fit within the larger history of Hollywood comedy. That’s the case with The Muppet Movie especially, which acknowledges its debt to comedic films past through cameos (Henson and Kermit forebears Edgar Bergen and Charlie McCarthy as talent-show judges; Bob Hope as an ice-cream salesman; Mel Brooks as a mad German scientist) and content. The movie casts Carol Kane in a brilliant recurring gag as a lisping bar patron who emerges at Kermit’s repeated exclamation of the word “myth.” That’s a bit of wordplay in the vein of the Marx brothers and Mel Brooks, and the type of joke that Zucker, Abrahams, and Zucker would push to comedic extremes in Airplane! the following year. (Airplane!’s jokes-per-minute ratio is only slightly higher than that of The Muppet Movie.) In contrast to the way more recent Muppet movies overexerted themselves in the race to catch up with contemporary pop-culture, Jerry Juhl and Jack Burns’ script for The Muppet Movie is remarkably self-assured—even though some of its reference points were already dusty in 1979. As far as Henson’s film output goes, The Muppet Movie is unimpeachable. It moves along at a rapid clip, the songs are fantastic (though Paul Williams has a tendency to overload his lyrics), and it features a timeless tale of characters overcoming the odds to achieve their wildest dreams. And in a way that makes for wonderfully high cinematic stakes, those dreams are always on the verge of falling apart: Kermit, Fozzie, Gonzo, Miss Piggy, and Rowlf all bond over a shared goal of getting to Hollywood, but the ill intentions of Charles Durning’s villainous restaurateur Doc Hopper (and Piggy’s ego) stand in their way. The Muppet Movie and The Great Muppet Caper succeed at providing material that’s entertaining to kids and adults, rather than kids or adults. 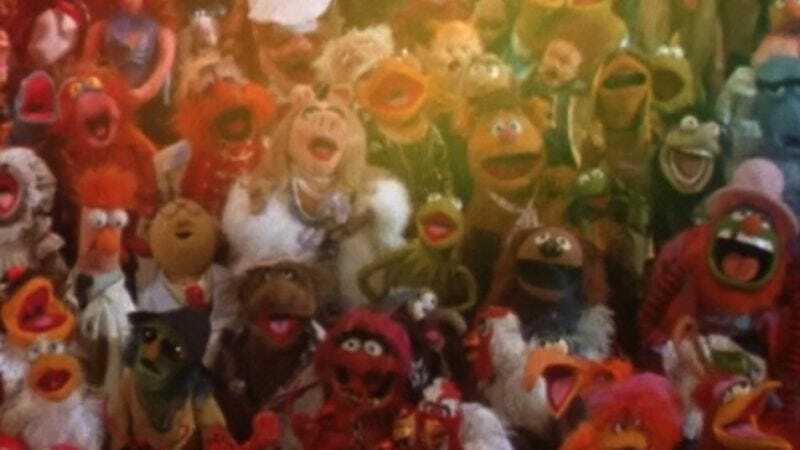 The films’ broader moments are tempered with an irreverent self-awareness—every line about Kermit and Fozzie being identical twins in The Great Muppet Caper acknowledges the extreme suspension of disbelief that a Muppet movie requires. (“No, Christine, that’s a frog—bears wear hats.”) The Muppet Movie requires a movie-within-a-movie framework to establish its shaky relationship with the fourth wall; The Great Muppet Caper, on the other hand, begins by blowing up that wall. Kermit, Fozzie, and Gonzo provide color commentary over the opening credits, then preface the events of the film with Joe Raposo’s sing-along-worthy “Hey, A Movie!” Segueing from the musical sequence to the first act, it’s explained that, while we’re watching Kermit, Fozzie, and Gonzo, the characters we’ll be following through the movie aren’t a harried variety-show host, his regular stand-up act, and his resident avant-garde provocateur, but a pair of investigative reporters and an intrepid photojournalist. It’s a weird element of self-awareness that probably flies over the heads of the film’s younger viewers—because Kermit still acts like Kermit in The Great Muppet Caper, in spite of his sudden change in employment—but for older viewers, it makes for a nice payoff to the “standard rich-and-famous contract” Orson Welles has drawn up for the cast at the end of The Muppet Movie. What we see in The Muppet Movie is just the first film they make under that contract—The Great Muppet Caper is its bigger, flashier, and almost-better sequel. You think one Muppet riding a bike in The Muppet Movie was impressive? Wait until you see nearly a dozen Muppets doing the same thing in The Great Muppet Caper! Is your mind blown yet? Unfortunately, The Great Muppet Caper’s cinematic largeness gets picked up and elaborated upon in The Muppets Take Manhattan—and by this film, the big moments seem less like attempts at showing off the technical prowess the Muppet performers can achieve with a big budget and more like an excuse for padding out the running time. Take, for example, the scene in which Rizzo and his rat friends fall into their roles in Pete’s Luncheonette, a neat display of Muppet magic in miniature—but it isn’t particularly funny, nor does it add much to the story being told. That story: a rehash of The Muppet Movie that has the gang jumping over shorter hurdles to achieve the less-grand goal of mounting a Broadway musical. It’s the middle ground between those two perspectives that keeps fans coming back to the Muppets as adults. We aren’t all going to outrun our own personal Doc Hoppers in our attempt to realize our dreams—but we can still succeed in spite of them. From what I’ve seen of Segel, Stoller, and Bobin’s The Muppets, it would appear that a whole new generation is about to be introduced to that concept. It’ll be good to have them onboard—even if Frank Oz doesn’t approve.